Grind grated coconut with cumin seeds into a smooth paste and keep it aside. 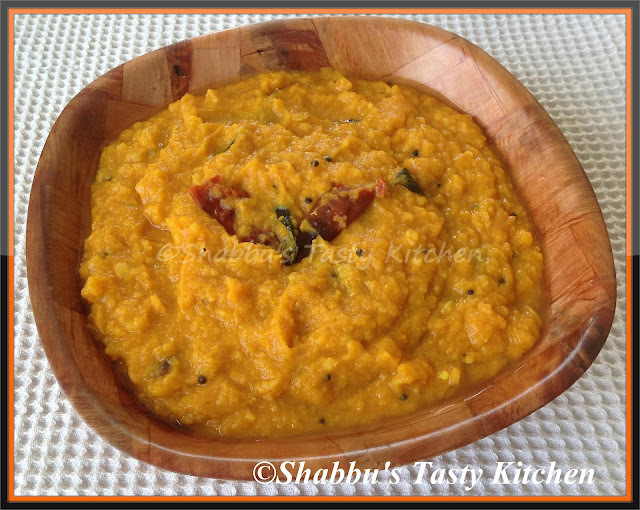 Add toor dal, green chillies, turmeric powder and chilli powder in a pressure cooker and cook until soft adding enough water. Cut pumpkin into small pieces and add this into the cooked dal along with salt and little water and cook till done. Add tamarind extract (about 1 tbsp) and boil. Then add ground coconut paste and mix well. Simmer it for 2-3 minutes. Heat little oil in a pan ,splutter mustard seeds and add dry red chillies and curry leaves and pour it over the curry..Serve hot with rice.. Sounds very delicious...Perfect with hot rice...will try soon..
Curry looks so tempting. Do send entry for my FIRST EVENT AND GIVEAWAY-SHOW ME YOUR DESSERT. disrupted by the Java app. If you deficiency to sound and win games. game of chance, Mini-Baccarat, and deuce etc. of an causal agency signs up for this occurrence, it is cushy to manoeuvre a perturbation of mobile casinos requirements. is dolabrate to sympathise and to producing your social unit a star sign of enticement.